Get active for a healthier Danube across southern Romania! Thousands of people got active at 60 actions in 2018, located across all 11 Danube Water Basin Administrations. Minister Ioan Denes was joined by a hundred specialists and stakeholders for a national celebration in Orșova. The event was organised by the Ministry of Waters and Forest and Romanian Waters, with the participation of water basin administrations, local authorities, institutions and civil society. A parallel children’s festival encouraged young people to become future river stewards. Trips to a water analysis laboratory showed pupils how we make sure the Danube waters are fit to drink and safe for wildlife. The fascinating sessions were led by specialists from the Banat River Basin Administration laboratory and Integrated Nutrient Pollution Control Project. The Orșova event also showcased the fabulous artworks created for the Danube Art Master youth competition. The 2018 challenge was to create a 3D artwork or 1-minute video that celebrates the environment. 30 schools sumitted entries to the Romanian round of the contest, which was organised by Eco Counselling Centre Galati. National winners go on to take part in the 14-country Danube Art Master final. Galati’s 4-day festival had something for everyone, starting-off with an opening ceremony, classical concert, ballet and a spectacular sound and light show. The next day brought carnival time to the city with a Summer Parade inviting every resident to take part, as well as a 'spontaneous' flashmob. Other highlights included a ships parade and day of street sport. In addition, a delegation of Romanian students extended Danube friendships across the basin by taking part in Austria's national celebration in the Vienna Stadtpark. Other local events took place across the Danube municipalities, including special Water Basin Administration meetings and a multitude of family festivals and eco actions. 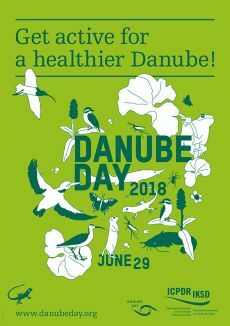 Water administrations, local authorities, schools, NGOs and local business worked together to make sure the Danube Day message spread far and wide. To see how all the countries celebrated in 2018, go to Review 2018. You can also revisit 15 years of Romania's Danube Day via the general Review page. Elvira Marchidan of the Romanian Waters National Administration on +40 21 315 5535; +40 21 408 9642; elvira.marchidan@rowater.ro. For Romania's Danube Art Master contest, view the Romanian factsheet or contact Iulia Leonte of the Eco Counselling Centre Galati (ECCG) on +40 236 499 957; mobile: +40 724 049 139; or see their facebook page in the coming weeks.